Music: Twinkle, twinkle, little star. 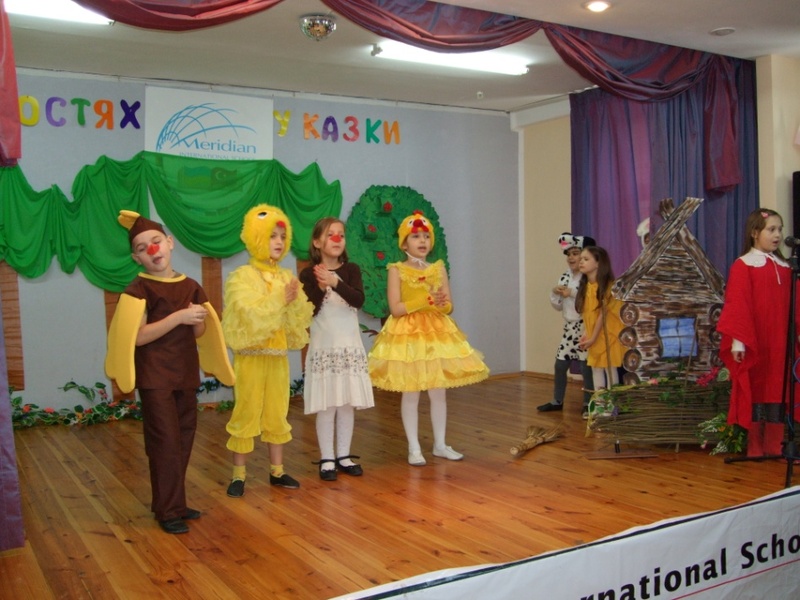 Storyteller: Once upon a time there lived a little red Hen in a little house in the wood. She has pretty, and hard-working children who help their mother very much. Every morning Jen the Hen wakes up very early and cleans her house and the yard very thoroughly. Hen: Madam, I’ve got three of them. One of them is yellow. One of them is brown. The nicest in the town”. Hen: Oh, but it’s already seven o’clock. It’s time to get up. Are you sleeping, children dear, children dear? Morning bells are ringing: ding, dong, dong! Chickens: Yes, Mummy, we are getting up! This is the way we wash our faces early in the morning. This is the way we brush our teeth early in the morning. This is the way we do the sports early in the morning. Storyteller: The Little Red Hen had many good neighbours and three good friends: Pam the Cat, Tug the Dog and Chuck the Duck. But they didn’t like to work and preferred to play, dance and sing all day long. Neighbour: Good morning, Mrs. Hen. Hen: Good morning, dear. How are you ? Neighbour I’m fine, thank you, and you? Neighbour: You have got so nice children, Mrs. Hen. Hen: Yes, they are very nice and I love them very much! Pam the Cat: Good morning, Mrs. Hen. Hen: Good morning, Pam the Cat! Pam the Cat, Pam the Cat, where have you been? Pam the Cat: I’ve been to London to look at the Queen. Pam the cat, Pam the cat, what did you there? Pam the Cat: I frightened a mouse under the chair. Tug the Dog: Wow, wow, Good morning, Mrs. Hen. Hen: Good morning, Tug the Dog. And BINGO was his name –o. And BINGO was his name – o.
Chuck the Duck: Good morning, Mrs. Hen. Hen: Good morning, Chuck the Duck. It’s a lovely day today, isn’t it? Hen: We must clean the yard and then we will cook dinner. Chuck, Tug, Pam, will you help us to clean the yard? Pam the Cat: Oh, no, I don’t want to! I want to play hide-and –seek with the Mouse. Tug the Dog: Oh, no, I don’t want to! I want to run in the yard! Chuck the Duck: Oh, no, I don’t want to! I want to swim in the pond! Hen: My dear children , will you help me to clean the yard? Chickens: Of course, we will! Let’s sing, dance and work together! 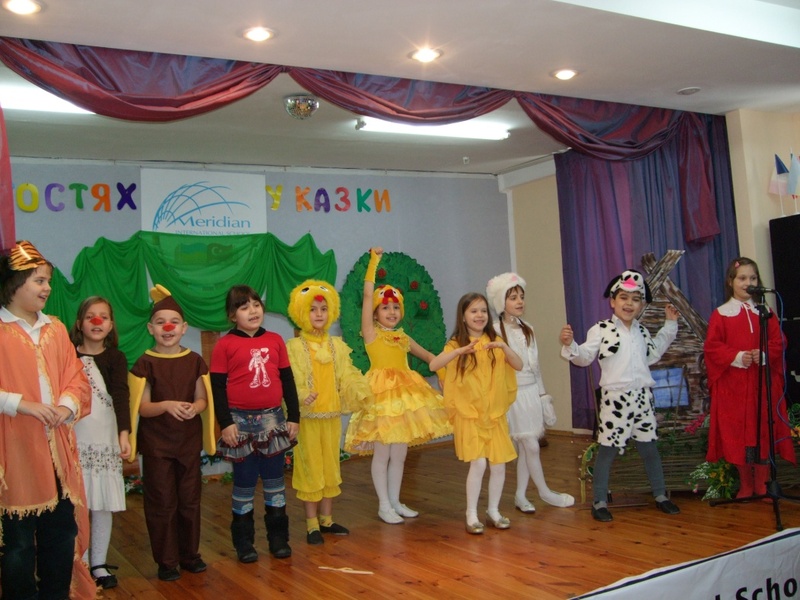 Storyteller: The three little chickens and their mother Hen are working very hard. Suddenly Mother Hen founds something on the ground. What is it? Hen: Oh, Look! I’ve found a cone of wheat. I want to plant the seeds. We will have much corn and I can make a cake! Pam, Tug, Chuck! Come and help me to plant the seeds! Pam the Cat: Mew, mew, mew. I don’t want to help you. I want to play with a Mouse. Tug the Dog: Bow-wow-wow. I don’t want to help you. I want to play catch with the duck. Chuck the Duck: Quack-quack-quack! I don’t want to help you. I want to swim in the pond! Hen: What a pity! Children, can you help me to plant the seeds? Chicks: Of course, Mummy! With great pleasure! Hoeing, hoeing, this is how we hoe the weeds…. Hen: Now, children, look! We’ve got many seeds now, and we can make a nice and tasty cake. Who will help me? Pam the Cat: Not I. I’m tired, and I want to have a little rest! Tug the Dog: Not I. I’m tired, and I want to have a little rest! Chuck the Duck: Not I. I’m tired, and I want to have a little rest! Hen: And now we’ve got the cake!Chickens: How nice it is! Wow! How tasty is the cake! I’m hungry, Mum! And I! And I! We want to eat the cake very much! Hen: O.K. Children. Let’s have dinner! Every morning , day and noon. Pam the Cat: I’m very hungry. Tug the Dog: I’m very-very hungry! Chuck the Duck: And I’m very-very-very hungry! Hen: Oh, no, my friends. You know the proverb: who doesn’t work, he mustn’t eat. Hen: Now you may go out, run and jump, swim and play. And next time you will be wiser, and remember the gold rule: Work while you work, play, while you play – this is the way to be happy and gay. All that you do, do with your might, things done by halves are never done right. Chickens: Oh, Mummy, how tasty the cake is! Yummy-yummy! Hen: Now, eat, my dears and go to bed. Tomorrow is a new day. Scene 4Storyteller: At this time Big Bad Fox was hunting in the forest. He was very hungry and his little children were waiting for him to come home with some food. He comes near the house and puts his head in the window. Fox: It smells a tasty cake and a delicious chicken! (licks his lips) Yummy-Yummy! Fox: Who is at home? (Sees a cake) Oh, here it is! What a nice cake I see! Fox: Ha-ha-ha! And I also have a delicious chicken for my little foxes at home. Chickens: The Big Bad Fox caught our Mummy and took her to his house. What are we to do? The Cat, the Dog And the Duck: What’s up? What’s the matter? Why are you crying? Chickens: The Big Bad Fox caught our Mummy and took her to his house. Help us, please! 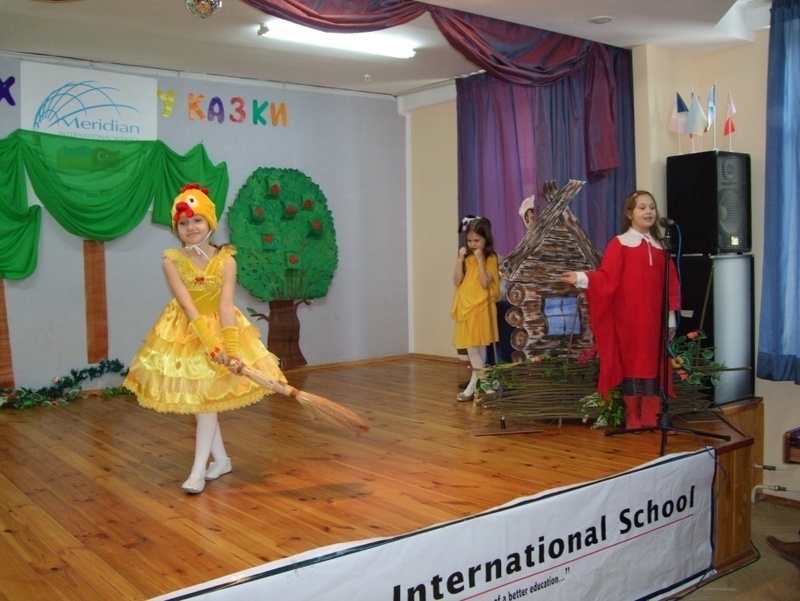 TheCat, the Dog And the Duck: Let the Little Red Hen go! Run away, Big Bad Fox! Or you will get no tail! Hen: Treat yourselves, My dear friends to the cake! Thank you very much – you’ve saved me from the Big Bad Fox. Pam the Cat: The cake is very tasty! Tug the Dog: The cake is very-very tasty. Chuck the Duck: The cake is very tasty. Now we want to help you all the time!